Spikenard root has a long tradition of use by Native American tribes and in the folk medicine of the Appalachian mountains where it found growing wild in rich open woods and thickets. The taste is mildly spicy, a bit woody, and has strong presence of the volatile oil. 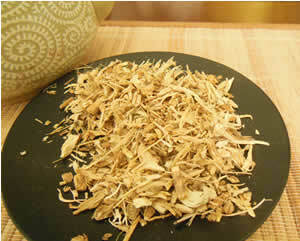 It combines will with American ginseng in both flavor and action. Warm spices such as ginger and cinnamon enhance the flavor. Recipe Instructions: Decoction :Bring to a boil over a low heat, simmer for 10 minutes. Let steep until cool enough to drink. Flavor with a bit of raw honey to bring out the flavor of the roots.